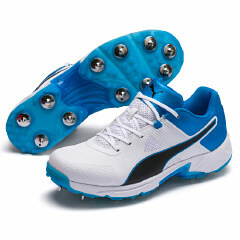 - The newly engineered PUMA Spike 19.1 is a top performance shoe for Cricket athletes. - New lightweight upper construction provides superb support for multi-directional movements. - Protective TPU skin is fused to the mesh for enhanced durability. - Toe area is reinforced for optimal protection and durability. - EVA midsole ensures optimal cushioning, and together with the high performance outsole, provides superior stability and traction. - Lightweight and breathable mesh fused with abrasion resistant TPU skin.